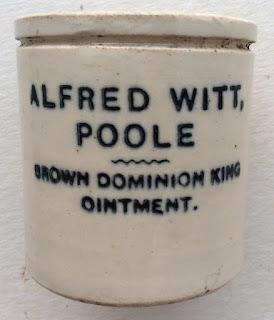 Reseach has not provided conclusive evidence to tie in Alfred Witt, the 'butcher and dealer', to the ointment pot bearing his name. 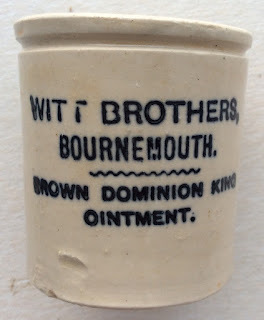 The Dorset 1915 Directory lists a business as Witt Brothers. Two pots exist of buff colour, both very rare. There are references to both of these two pots in BBR magazines numbered 85 and 103. 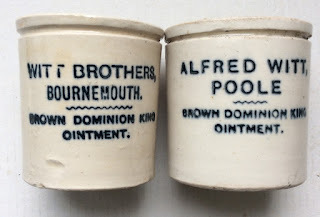 Further information regarding these pots can be obtained from the Historical Guide to Delftware and Victorian Ointment Pots book produced by Messrs. Houghton & Priestley, page 139.